If you keep up with current health news, you’re probably familiar with the buzzword inflammation and the ongoing discussion about the potentially harmful effects it can have on our health. Before we try to understand why inflammation is so important and how it affects our health, let’s first consider the simple but very important question: what exactly is inflammation? Simply put, inflammation is an important and necessary part of our natural immune response. Its job is to protect our body against harm by defending it against foreign invaders, fighting off infections and illnesses, and repairing damaged cells and tissues in our body after injury. Normally, our immune system triggers inflammation when it recognizes anything that is alien in our body. Such triggers can include invading bacteria or viruses, cigarette smoke, plant pollen, and the many thousands of synthetic chemicals we are exposed to during our lifetimes. We’ve all experienced inflammation when we develop a fever, bruise our knee, or cut our finger. Blood flow to the affected area increases, which is why it typically turns red. Fluids and proteins from blood enter the injured tissues, which can cause localized swelling. Finally, our immune system sends a small army of white blood cells to the rescue. These typically include neutrophils, which are usually the first to travel to the site of an infection or injury. Neutrophils can literally swallow damaged cells and foreign invaders and also release enzymes that kill them. Neutrophils may be accompanied by macrophages, another type of white blood cell that engulfs and “eats” anything not seen as healthy or normal. In other words, short term or “acute” inflammation is a necessary, health-preserving component of our immune system’s response to injuries and infections. Without it, injuries could linger on and harm us, while even minor infections could turn deadly. However, the key to the inflammatory process is that it is only meant to last a short time. Once our body has dealt with and gotten rid of the initial trigger or cause, the process of healing and repair should ideally begin. Unfortunately, when our body’s inflammatory response goes on for too long or spirals out of control – known as chronic inflammation – it can lead to many adverse health conditions, according to health experts. Chronic inflammation can happen when our immune system sometimes sends an inflammatory response to a perceived threat that doesn’t really exist. At other times, the threat may be real but goes on for so long that our body’s inflammatory response also persists for a long time. Persistent, uncontrolled inflammation – which has been linked to external factors we’ll discuss below – is damaging because it acts like a slow-burning fire, continuing to send out immune cells that eventually begin to attack healthy cells and tissues in our body. “It’s a smoldering process that injures your tissues, joints, and blood vessels, and you often do not notice it until significant damage is done,” according to Dr. Andrew Luster, of the Center for Immunology and Inflammatory Diseases at Harvard-affiliated Massachusetts General Hospital. Harmful free radicals, including reactive oxygen species (ROS), are believed to be the underlying cause of the damage to healthy cells caused by chronic inflammation. Not only that, scientific research suggests that certain free radicals can directly initiate or even amplify inflammation by turning on several different genes that are involved in triggering and maintaining the inflammatory response. These free radicals, including ROS, are likely created by the actions of the various immune cells that have been activated by the inflammatory process, specifically by the chemicals and enzymes they release into our body’s damaged tissues. What is Chronic Inflammation Responsible for? Chronic inflammation is now known to cause the buildup of plaque in arteries known as atherosclerosis. Our body sees such plaques as abnormal, so it tries to wall them off from flowing blood. But when that wall breaks down – and it eventually does – the plaque can rupture. The plaque’s contents then mingle with blood, forming a clot that can block blood flow downstream where the blood vessel becomes narrower. These clots are responsible for most of the deadly heart-related health conditions that affect many people today. Similarly, the more visceral fat cells we have – this is the kind of fat that builds up in the abdomen and wraps itself around organs – the more likely it is that our immune system sees them as a threat and triggers inflammation. As a result, more white blood cells enter our blood looking for a fight. In other words, the longer we stay overweight or are obese, the longer our body remains in a state of constant inflammation. According to Dr. Luster, “This reaction is not confined to one particular place either. Inflammation can travel throughout the body and cause problems all over.” Chronic inflammation is now believed to also contribute to the development of clinical depression and anxiety, generalized body pain, gut health disorders, and abnormal levels of tiredness or fatigue. So, the question is: what triggers chronic inflammation and how can we manage these risks to reduce or even completely avoid our chances of developing an inflammatory condition? #1. Foods with a high glycemic index (GI) and added sugar. These include processed and refined foods such as white flour, instant mashed potatoes, and polished white rice, sweetened foods such as cakes, cookies, and muffins, and many commercially available breakfast cereals, breads, and pasta sauces. The glycemic index (GI) is a ranking of carbohydrates on a scale from 0 to 100 according to the extent to which they raise our blood sugar levels after consumption. High GI foods are rapidly digested, absorbed, and metabolized by our body and cause significant fluctuations in our blood sugar levels. Low GI carbs produce smaller fluctuations in our blood glucose and insulin levels; and according to many health experts, they represent one of the secrets to long-term health. A 2002 study showed that processed sugars and high GI foods increase inflammation levels, leading to a greater risk of developing other health disorders. On the other hand, consumption of whole grains has been shown to reduce levels of the inflammation markers C-reactive protein and plasminogen activator inhibitor type 1. High GI foods and excess dietary sugar likely trigger inflammation because they increase levels of chemical compounds in our body known as advanced glycation end products (AGEs), along with raising our risk of developing insulin resistance and harmful changes in lipid metabolism. Scientific evidence shows that AGEs trigger inflammation in multiple ways. AGEs have also been shown to interfere with our body’s natural antioxidant defense systems and may even contribute to organ damage, compromising our health. #2: Trans fats. A small amount of trans fats occur naturally in certain animal foods. However, most of them are synthetically made in an industrial process that uses high pressure and chemicals to add hydrogen to liquid vegetable oils to make them more solid and have a longer shelf life. The resulting end products, known as “partially hydrogenated oils,” are difficult for our body to process and end up triggering inflammation, at least partly by damaging cells in the lining of our blood vessels. In 2013, the U.S. Food and Drug Administration (FDA) determined that partially hydrogenated oils are no longer Generally Recognized as Safe (GRAS) in human food. Indeed, consumption of trans fats in 823 generally healthy women in the Nurses’ Health Study I and II was seen to raise their levels of markers of systemic inflammation. In other words, consumption of foods and food-related products containing trans fats should be completely avoided, as they have been shown to harm our health. #3: Saturated animal fats. Consumption of saturated animal fats has been linked to a greater risk of developing inflammation-related health disorders in a number of studies. It should be noted that many health experts who are in favor of high fat diets point out that studies on saturated animal fats don’t take into account the quality of animal fats being consumed. They believe that fats from pastured, grass-fed animals do not cause damage to the body as do saturated fats from conventionally-raised (factory farmed) animals that are fed grains. How meat is cooked is also a factor. Grilling protein foods such as meat and fish creates two kinds of pro-inflammatory chemical compounds – heterocyclic amines (HCAs) and polycyclic aromatic hydrocarbons (PAHs), which are also found in cigarette smoke. The charred bits at the edges of barbecued meat and fish are especially high in these toxic compounds. Cooking meats more slowly at lower temperatures is the best way to avoid inflammatory HCAs and PAHs. Overall, the take-home message with regards to saturated animal fats is to consume quality sources, and be careful not to overly heat them. #4: Excessive alcohol consumption. Our liver breaks down most of the alcohol we consume before our kidneys get rid of it. Unfortunately, the very process of breaking alcohol down generates toxins even more harmful than alcohol itself. These so-called “byproducts” of alcohol metabolism damage our liver and kidney cells, promote inflammation in our body, and weaken our natural defenses. While our liver and kidneys are especially vulnerable to alcohol-induced damage, other organs can also be damaged and many of our body’s metabolic functions can be disrupted by excessive alcohol consumption. 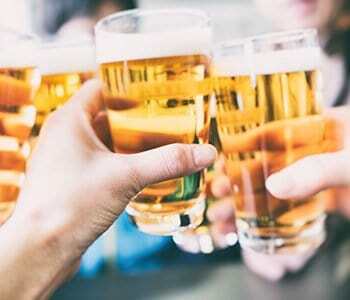 Heavy drinking, even for a few days, can also cause fat to build up in the liver, a condition known as steatosis, or fatty liver, which is the earliest stage of alcoholic liver disease. The fat buildup makes it more difficult for the liver to do its job properly and can lead to dangerous, life-threatening conditions such as alcoholic hepatitis. Also, certain bacteria in our gut make a compound known as lipopolysaccharide (LPS), which has been shown to induce inflammation. Unfortunately, alcohol consumption greatly increases the transfer of LPS from our gut into our bloodstream. When we are healthy, the adverse effects of LPS are kept under control. For example, the liver plays a central role in detoxifying LPS. However, regular and especially excessive alcohol intake damages both our gut and liver over time, leading to persistent systemic inflammation caused by LPS and ultimately, to irreversible organ damage. #5: Celiac disease. An estimated 3 million Americans suffer from celiac disease, a common heritable chronic inflammatory condition of the small intestine—and up to 30% of U.S. adults now want to avoid or cut down on gluten in their diets, according to a recent survey. Gluten is a spongy complex of proteins found in wheat, barley, and rye that allows dough to rise. As foods containing these grains are baked, yeast ferments sugar and releases carbon dioxide, causing gluten to inflate, giving breads and cakes their familiar texture. Celiac disease occurs when small gliadin proteins (a component of gluten) that are resistant to complete digestion directly affect intestinal cell structure and function by manipulating gene expression and via oxidative stress. This provokes a powerful, misdirected inflammatory response from our immune system and white blood cells. As we continue to eat foods containing these proteins, the state of inflammation in our body becomes chronic. This continuous “friendly fire” ends up damaging microscopic finger-like structures known as villi that line our small intestine, which are specialized for nutrient absorption. Ongoing damage to villi leads to typical symptoms of celiac disease such as belly pain, diarrhea, iron deficiency, and other digestive issues. #6: Smoking. Cigarette smoke has long been known to be very harmful for health. Several toxins in the smoke interact with our immune system, with adverse consequences. These toxins induce chronic inflammation at the membranes lining our oral, gut, and lung cavities which is helped along by harmful free radicals known as reactive oxygen species (ROS). Chronic obstructive pulmonary health disorders (COPD) – also known as chronic bronchitis or emphysema – are a leading cause of death all over the world. A progressive health condition that makes it hard to breathe and which gets worse over time, COPD causes prolonged coughing with large amounts of mucus, wheezing, shortness of breath, chest tightness, and other symptoms. Cigarette smoke is the leading cause of COPD. Up to 75% of people who have COPD smoke or used to smoke. However, long-term exposure to other lung irritants such as pipe, cigar, and other forms of tobacco smoke, air pollution, chemical fumes, or dusts can also contribute to COPD. #7: Chronic, uncontrolled stress. Major life stressors, including those involving interpersonal stress and social rejection, are now thought to trigger inflammation by increasing levels of pro-inflammatory cytokines in our bloodstream. [Note: cytokines are small secreted proteins released by various immune cells, which have specific effects on the interactions and communications between immune cells]. These cytokines are now also known to cause profound changes in our behavior, including mood suppression, an inability to feel pleasure, fatigue, and social withdrawal. This behavioral response to adverse social circumstances may have originally had some survival value. However, in the present day, it may be over-activated by social, symbolic, and imaginary threats. This connection between long-term social stress and inflammation may explain how and why mood health disorders develop, why they are strongly predicted by early life stress, and why they might coincide with certain physical health disorders also known to be triggered by chronic inflammation. #8: Overweight and obesity. Obesity is a global epidemic whose prevalence is increasing, with more and more younger people being affected in both developed and developing countries. Scientific and clinical evidence shows that obesity triggers inflammation – a low-grade, chronic level of inflammation that takes place in cells in fat tissue, liver, muscle, pancreas, and brain in response to too much nutrients and energy. This “metabolic” inflammatory response is known to contribute to insulin resistance and various metabolic health disorders. For a long time, fat cells (known scientifically as adipocytes or lipocytes) were considered to be little more than storage cells. However, they are now known to be a critical component of how our body’s metabolism is managed. Intriguingly, fat cells also secrete hormones directly into our bloodstream. In lean individuals these hormones modulate body fat. However, as a person becomes overweight or obese, their enlarged fat cells begin to misbehave, immune cells known as macrophages start accumulating in fatty tissue, and long-term inflammation is the inevitable outcome. These larger than normal fat cells also release many chemical molecules that increase our risk for various metabolic health disorders. #9: High ratio of omega-6 to omega-3 polyunsaturated fatty acids. Both omega-3 and omega-6 polyunsaturated fatty acids (PUFAs) are “essential” fatty acids that are absolutely necessary for maintaining our health and wellbeing. However, our body cannot make them on its own, so we have to get them in our diet. Both PUFAs play a crucial role in our brain function, and in our normal growth and development. Historical evidence indicates that human beings have evolved on a diet with a ratio of omega-6 to omega-3 PUFAs of approximately 1:1, or at best 2 or 3:1. Whereas in the standard American diet (SAD) of today this ratio is as high as 15 or even 20 to 1. In other words, most present-day western diets are seriously deficient in omega-3 PUFAs and contain excessive amounts of omega-6 PUFAs. A proper balance of omega-3 and omega-6 PUFAs is believed to be health-promoting, because omega-3 PUFAs help to reduce inflammation. On the other hand, consumption of excess omega-6 PUFAs – such as those found in corn, safflower, sunflower, grapeseed, soy, peanut, and vegetable oils, mayonnaise, and many salad dressings – can trigger an inflammatory response. Therefore, a high ratio of omega-6 to omega-3 PUFAs in our diet is believed to contribute to the development of inflammation-associated health disorders. In support of this theory, a ratio of 4:1 of omega-6 to omega-3 PUFAs was seen to be associated with a 70% decrease in the death of patients with heart-related health problems. Similarly, a ratio of 2 to 3:1 was seen to suppress inflammation in patients with joint-related problems, whereas a ratio of 5:1 had a beneficial effect on patients with asthma. In other words, a low ratio of omega-6 to omega-3 PUFAs – similar to that seen during early human evolution – may be ideal for reducing our risk for the many chronic illnesses that are prevalent globally today. #10: Pollution and environmental toxins. Today we live in a “toxic soup,” with pollutants all around us that adversely affect our health and well-being. According to experts, more than 80,000 hazardous chemicals contaminate the air we breathe, water we drink, food we consume, skin and hair care products we use regularly, and household cleaning products we try to protect ourselves with. For instance, the air around us contains many toxic pollutants. These enter our bodies through our eyes, skin, and lungs and cause serious health problems, including at the immunological, neurological, reproductive, and developmental levels. Health experts believe there’s a connection between the massive levels of airborne pollutants and the dramatic increase in prevalence of asthma and allergies worldwide over the last few decades. Airborne toxins are now known to adversely affect the development, balance, and activity of our immune system­, and therefore, our ability to generate an inflammatory response with far-reaching consequences for our health throughout our lives. Toxins in our water supply can be readily taken up the body through our skin. For example, while bathing or showering. Chlorine and fluoride can be present in tap water, lead can leach into home water supply from pipes, while well water can be contaminated by toxins in ground water. Further, many of our health problems today are believed to be related to the changes in the way farming is carried out, including genetically-modified (GMO) crops sprayed with massive amounts of herbicides containing gyphosate. Not only that, mass food production methods – wherein growth hormones and antibiotics are routinely used in cattle and poultry farming, food irradiation is used to make food safer, herbicide and pesticide use is standard practice, and food is enhanced with food additives such as preservatives – are pumping more toxins into our body and playing havoc with our health. Constant exposure to all these environmental toxins promote a state of chronic inflammation and oxidative stress (defined as a disruption in the balance between ROS production and our antioxidant defenses) in our body, along with interfering with glucose and cholesterol metabolism, inducing insulin resistance and metabolic disorders, disrupting mitochondrial function, and altering thyroid metabolism. In summary, inflammation is an important and necessary part of our natural immune response which is designed to protect us against various types of harmful situations. Short term or acute inflammation is necessary for good health, but it is only meant to last a short time. When our body’s inflammatory response is chronic and goes on for too long, it can contribute to the development of many health disorders. Damage to healthy cells and tissues in our body caused by chronic inflammation is believed to be mediated by free radicals, including ROS – and they can even directly initiate or even amplify inflammation. As seen in the detailed discussion above, the top ten worst offenders for chronic inflammation include overly-processed, refined and sweetened high GI foods, consumption of trans fats, poor quality saturated animal fats and excessive alcohol, celiac disease, smoking, being exposed to chronic, uncontrolled stress, being overweight or obese, consuming a high ratio of omega-6 to omega-3 PUFAs in our diet, and exposure to high levels of pollution and environmental toxins. The ancient South Asian spice turmeric has been extensively studied for its potential to help maintain healthy inflammation and oxidation levels in the body. Turmeric 3D from Organnixx provides you one of the most “bioavailable” forms of turmeric due to its unique fermentation process. This means your body experiences the maximum benefits of the purest, most potent turmeric available! Harvard Health Letter: What is Inflammation? Dietary Sugars and Endogenous Formation of Advanced Glycation Endproducts: Emerging Mechanisms of Disease. Effect of diet-derived advanced glycation end products on inflammation. Dietary intake of trans fatty acids and systemic inflammation in women. Dietary-fat-induced taurocholic acid promotes pathobiont expansion and colitis in Il10-/- mice. Anti-inflammatory effects of a low arachidonic acid diet and fish oil in patients with rheumatoid arthritis. Why Do So Many People Think They Need Gluten-Free Foods? Obesity and the role of adipose tissue in inflammation and metabolism. The Effects of Environmental Toxins on Allergic Inflammation. Inflammation is an important and necessary part of our natural immune response to protect our body against harm. Our immune system triggers inflammation when it recognizes anything that is alien in our body. The inflammatory process is only meant to last a short time. When our body’s inflammatory response goes on for too long – known as chronic inflammation – it leads to adverse health conditions. GMO’s didn’t make this list? Goes without saying,I suppose. So true!!! I totally agree!!! My main source of pain!!! I avoid all nightshades always, but sometimes they are in foods, hidden. Hi Marion! Nightshades are a botanical family of plants and include foods like hot peppers, potatoes, tomatoes, and eggplants. What about inflamed sciatic nerve? I am assuming when the sciatic nerve becomes inflamed that causes the body to become inflamed as well but I have never read anywhere that is the case. I’d like to know too. I have the same problem. Well sciatica is caused by local pressure on that nerve. That’s not going to cause an inflammation problem in the rest of the body. But if you consider fibromyalgia which affects nerves throughout the body that’s something different. Hi I recently purchased Iodine , on my 2nd day. I suffered from chronic inflammation I’m my right hip. After no treatment other than an x- ray at my local hospital and 18months of waiting for appointments I referred my self to the orthopaedic hospital in Oswestry . My Spencer – Jones within 8 weeks diagnosed acute inflammation and after MRI I had a steroid in my hip. I have also a Labill tear so waiting for another in the head of my femur. So I am wondering if I can take the turmeric along side the Iodine? I am a 66 year old Pilate instructor and quite healthy. My lifestyle is as you advise… INSPIRED. No one seems to put together all the aspects of health, one of the most important is Emotions , they affect your well being more than anything. After going through 3 bereavements, moving house I realise that although quite healthy this more than anything affected my general well being more than anything. So thank you for your informative videos and the INSPIRED concept. So true. The emotional. State is seriously under rated. Consider Prolotherapy, PRP and even stem cell therapy. Google “Caring Medical”. I live in South Africa and had a series if prolotherapy injections in my lower back that has alleviated my symptoms greatly. My dentist recently told me that my tooth had a deep infection. No pain and may have been like this for years. Would this result in inflammation? Because eliminating as many as you can improves your life. I eat organic, grass-fed, healthy foods, only drink purified water, my cleaning products are baking soda, vinegar and lemon (organic), my skin/hair care is chemical free, organic, working on converting my makeup. I feel good, and strive to avoid new products, like cars, furniture, cotton. New products have tons of chemicals. Buy used cars, even 1 or 2 years old has lost many of that new car chemical smell, I love antiques, so my furniture is old before chemicals were used, and it’s real wood. My sheets are organic cotton as cotton is processed with lots of chemicals, same with towels. I use an air filter in my house to pull in extra chemicals in the air. There’s much you can do. Avoid smokers, places that smell like chemicals, bad food and you have a great start. Make changes slowly and incrementalLy so it is not so daunting. It is worth it! Thank you for that information. You mentioned celiac disease as a cause and yet it i itself has a cause.-usually diet.Dr Tom O’Bryan shows how wheat( gluten) is inflammatory to everyone and causes problems in the gut even if you do not have celiac disease or show symptoms. I found the Omega 6 and Omega 3 section confusing but would like to know more. You spoke about having a better balance but did not give examples of each of how to go about doing that. Thank you again for your article that is loaded with valuable information. Thank you for sharing, Barbara. We’re happy that you found this post informative! If someone somewhere has an answer to progressive osteoarthritis-let me know-as I cannot even walk without a trusty walker and cane. You failed to mention one of the most important sources of chronic inflammation, EMF exposure. Induced body from exposure due unshielded wiring in most residential homes is causing an induced high body voltage in many people, which leads to chronic inflammation.